Human rights defenders have raised alarm over the proposed reform, arguing that the sweeping definition of “terrorism” in the bill leaves activists and social leaders vulnerable to harsh criminalization and violence at the hands of military and police forces. Article 590 of the new Criminal Code defines “terrorist associations” as groups with the aim of “gravely subverting the constitutional order or provoking a state of terror in the population or part of it.” Critics were particularly concerned by the section of the article that states that a group can be considered terrorist association “even if its established purpose is a lawful one” and the fact that judges will have discretion to determine what fits the definition of terrorism. The article, passed with 42 votes in favor, 33 against, and one abstention, goes on to establish “prison sentences of 15 to 20 years” and a fine as punishment for the “managers, promoters or financiers” of such “terrorist” organizations. Eugenio Sosa, sociologist and professor at the National Autonomous University of Honduras, characterized Article 590 as a continuation of a trajectory beginning with the 2009 U.S.-backed coup that has escalated toward more violent means of clamping down on civil society. 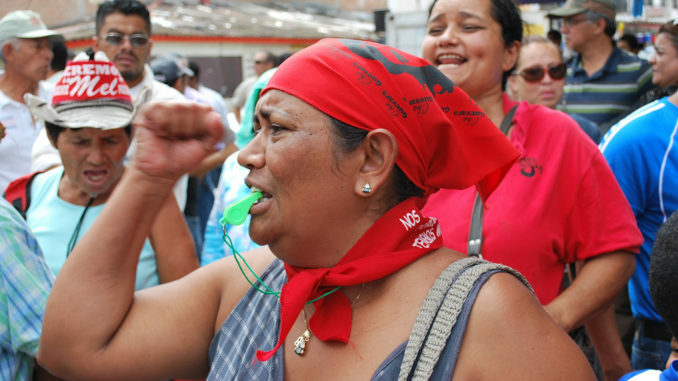 Amid the immediate shock and confusion of the June 28, 2009, ouster of former Liberal Party President Manuel Zelaya, social movements consolidated a broad-based resistance movement in the streets to in an attempt to rollback the coup and halt the grave human rights abuses accompanying the military takeover. The unprecedented National Front of Popular Resistance also demanded deeper transformation of the country’s young and fragile democracy through a National Constituent Assembly to rewrite the 1982 Constitution. 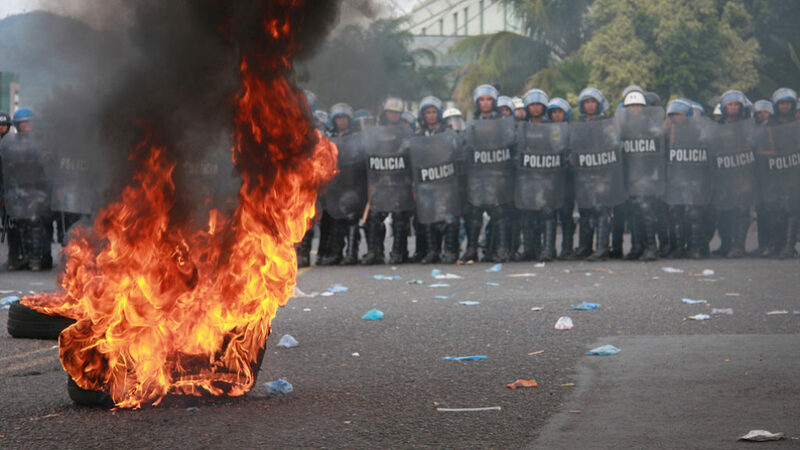 But the crackdown on the popular uprising was bloody, and according to a December 2009 report from the Inter-American Commission for Human rights, included deaths, declaring martial law, criminalizing dissent, arbitrary detention, militarization, and a host of other grave violations of human and political rights. The human rights situation continued to deteriorate after the coup with targeted assassinations, forced disappearances, and torture as state terror rained down on human rights defenders, journalists, lawyers, LGBTI activists, Indigenous and campesino leaders, and others. 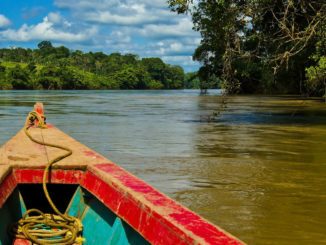 According to Global Witness, Honduras is the most dangerous country in the world for environmental defenders, with more than 120 killed since 2010, while the Inter-American Commission on Human Rights documented murders of 28 journalists between 2010 and 2015. And this was all before protesters could be legally classified as terrorists. Leader of the grassroots movement Ofraneh, representing the country’s Afro-Indigenous Garifuna communities, Miriam Miranda – who has suffered threats, attacks, violent arbitrary detention, and other harassment as a result of her outspoken criticism of neoliberal privatization and land grabbing in Honduras – told Upside Down World that Article 590 is the latest in a series of “legislative blows” to freedom of expression and the right to protest that have reached new heights this year with the Criminal Code reforms. “The current government administration has done everything possible to restrict dissent as part of the re-election strategy laid out by the Juan Orlando Hernández regime,” she said, referring the president’s bid for a second term in office, a move that many have condemned as unconstitutional. She also noted that mainstream media has played a role in downplaying the extent of public outcry and protest in the country. Miranda added that the “recomposition of political forces” since 2009 has paved the way for the “approval of countless neoliberal and undemocratic laws,” while systematic disappearance and assassinations of government detractors has been largely overshadowed by high levels of everyday violence, fueled by the generalized lawlessness brought on by the coup. 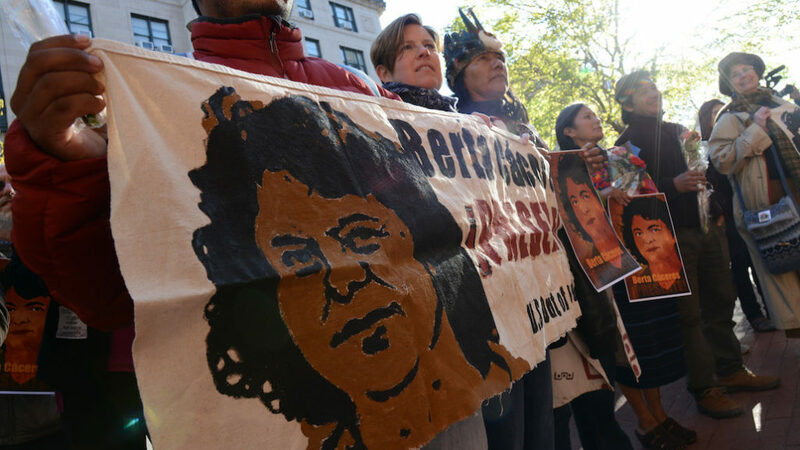 The murder of iconic resistance leader and Indigenous environmental activist Berta Cáceres in March 2016 – after she had suffered numerous assassination attempts, harassment, and threats of physical and sexual violence as a top target on a military hit list – is one emblematic case in an unchecked human rights and impunity crisis. Many fear the assault on dissident voices in the deadliest country in the world for environmental defenders and one of the most dangerous countries in the world for journalists will only get worse with Article 590. An earlier version of Article 590 targeted social protest as terrorism even more explicitly, including in the definition of terrorist associations those that “seriously alter the public peace.” After facing widespread opposition, the controversial clause was scrapped in the final version of Article 590 that was just approved, but critics are highly concerned that the inclusion of groups with both legal and illegal aims in the definition of terrorism leaves the potential for interpretation dangerously broad. The article, together with the other reforms in the new Criminal Code, are expected to take effect next year. But not without a fight. Tomé and his colleagues already successfully removed from the new Criminal Code a controversial reform that had been approved earlier this year. Article 335-B, also referred to as the “Gag Law,” targeted journalists with four to eight years in jail for the crime of “apology, exaltation or justification” of terrorism. The reform drew criticism from the Inter-American Commission for Human Rights and United Nations human rights office, which argued that the ambiguity of the article threatened to restrict freedom of expression, while Honduras’ public prosecutor’s office symbolically declared the reform unconstitutional. Congress voted earlier this month to repeal Article 335-B, though it will remain in force until the new Criminal Code takes effect. But whether Libre will be successful in winning an overhaul of Article 590 will depend on its ability to organize a unified opposition within Congress. An article in Honduran media outlet El Pulso the day after the vote on Article 590 argued that despite being critical of the move to criminalize social protest and blaming lawmakers of President Juan Orlando Hernández’s National Party for pushing through the reform, members of the opposition in Congress enabled it to go through by showing up to allow Congress to reach quorum without staying to vote against the controversial reform. The votes in favor overwhelmingly came from President Juan Orlando Hernández’ ranks, with just two Liberal Party lawmakers siding with 40 National Party lawmakers to approve the article. On the opposing side, 11 Libre lawmakers were joined by 16 Liberal Party members and six other lawmakers in rejecting the measure. Libre’s 28 seats together with the Liberal Party’s 31 seats outnumber the National Party’s 52 members of Congress. “If the opposition lawmakers had stayed in the session to which they gave quorum, the article wouldn’t have passed,” wrote Estrada. But Sosa argued that the framing in recent years of the Liberal Party, historically part of the country’s ruling elite, as an opposition force in the post-coup era is uncomfortable at best, and could create unrealistic expectations for how lawmakers may vote in Congress. “I don’t know what to expect from a more than 100-year-old ruling party in Honduras, responsible for everything that is happening, above all the coup,” he said, arguing that even though the numbers add up for Libre and the Liberal Party to join forces as an opposition bloc, it is largely “self-damaging to see the opposition in this way” since the Liberal Party is “part of the same oligarchic group” as the National Party. Factions of the Liberal Party – together with the Supreme Court, Congress, and the military – conspired to carry out the coup against Zelaya, a wealthy rancher, after he made modest progressive reforms during his term in office, most controversially calling for a non-binding poll on whether to hold a referendum in the 2009 election on convening a Constituent Assembly to rewrite the Constitution. With Libre positioning itself as the legitimate opposition force in Congress by leading the effort to block repressive reforms to the Criminal Code, the upcoming Nov. 26 elections are a key opportunity. Gaining political power could mean preventing a further rollback of rights and finally fighting for the deeper political transformation that was at stake when elites and the military, backed by the U.S. State Department, executed the 2009 coup. But eight years after constitutional crisis, the road to rebuilding the country’s fragile democracy is still fraught with challenges. President Juan Orlando Hernández, who beat Libre’s candidate Xiomara Castro in the 2013 election amid widespread cries of electoral fraud, is running for a second term – a move that critics have slammed as unconstitutional and that has become the hallmark of right-wing hypocrisy and political amnesia in the country less than a decade after coup-perpetrators justified Zelaya’s ouster by falsely claiming he was attempting to seek re-election. And two months ahead of the election, an opposition coalition between Libre, the Anti-Corruption Party, and the Innovation Party and United Social Democracy alliance (PINU-SD) – united under the banner “Opposition alliance against the dictatorship” and represented by candidate Salvador Nasralla – has warned of a concerted government fraud plot to rig the election and promise a more thoroughly-planned and technologically-supported repeat of the contested 2013 race. 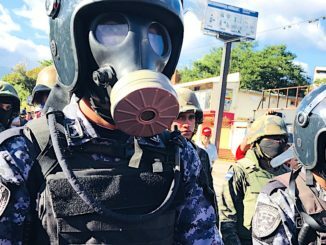 Criminalizing protesters as terrorists in the new Criminal Code could help shield Hernández from a popular uprising in case of fraud. 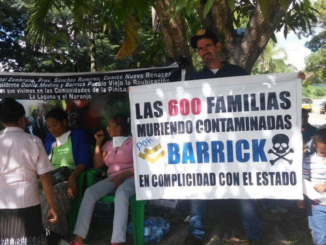 But the land activists, human rights defenders, environmental warriors, and other dissident voices putting their bodies on the line to defend their rights and resources have already lost too many to the struggle since the last election. Social movements are increasingly in the crosshairs, and they can’t afford another opposition loss.